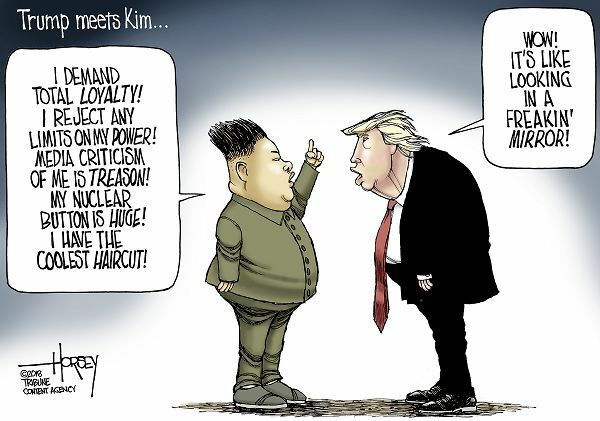 So Trumpery has agreed to meet with Kim Jong-Un. Trumpery gives North Korea, from the start, exactly what North Korea has wanted for decades... respect and recognition on the world stage. North Korea has their nuclear toys. They have no reason to give them up, and they are not going to. What a stable genius! What a deal maker! And you Trumpery nuts raked Obama over the coals for caving in to Iran, which BTW... still does not have nuclear weapons. And there is a bonus. Stormy Daniels has been moved off the front pages. Kim Jong-Un is playing the United States like a fiddle. I wonder if Putin and Kim Jong-Un compare notes? If this meeting does in fact take place, the first thing that should happen before anything is discussed/negotiated is the release of the three American hostages being held in North Korea. We'll see what Trumpery does.